The National Safety Council reported that the United States is on track to reach nearly 40,000 roadway deaths for the third year in a row. Though that’s a grisly record to hold, the good news is that the number represents a leveling off of death rates which had been climbing rapidly the previous two years. Clearly, vehicle crashes are an issue affecting everyone driving on our nation’s roads. A common site for accidents is I-595, a busy highway with an important duty ferrying our motorists where they need to go. However, the amount of traffic and the frequency of use means that there are often accidents that result in injury and even death. An accident which garnered significant news coverage was an accident involving a school bus on I-595. Two vehicles collided in front of a bus, causing the school bus to run into the vehicles. Fourteen children and four adults were taken to the hospital, but luckily no one was seriously harmed. A few children reported neck injuries, but the bus driver’s quick thinking and sharp reflexes prevented any permanent damage. Though the cause of the accident is still under investigation, security footage shows that it was likely due to an improper merge. Looking twice, in both your rearview mirror and by physically looking behind you, decreases your risk of an accident, and you should always be sure to check your blind spots. A tow truck driver lost control of his vehicle and nearly ran his truck off a raised section of I-595 in a recent accident that left the driver with minor injuries. He crashed the vehicle into a concrete median wall and came to rest with the truck’s wheels dangling off the raised highway. The crash shut down three lanes of I-595 just west of 95. Larger vehicles like heavy-duty trucks and tow trucks need to exercise caution when driving through tunnels, bridges, and elevated sections of highways, as their increased weight gives them more momentum than other vehicles. 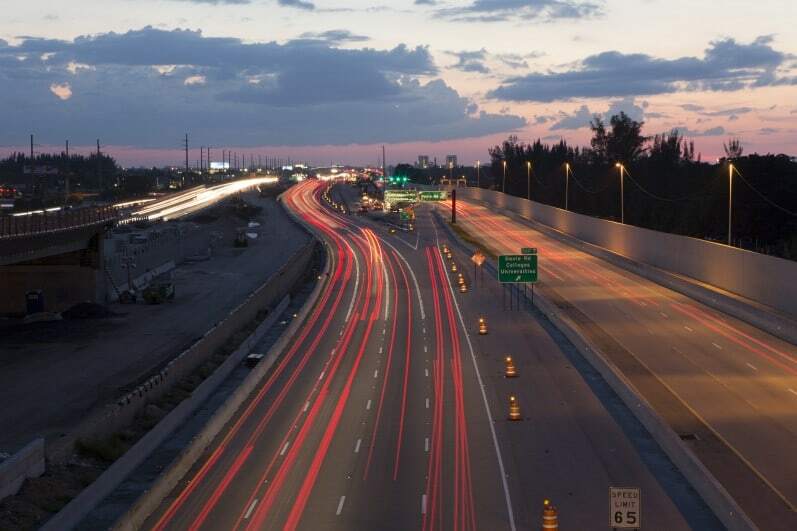 A multi-car collision resulted in one dead in an early morning accident on 595 in late September when the driver lost control of his vehicle and was struck by a second vehicle. The impact sent his vehicle ricocheting across several lanes of traffic. A multi-car collision is especially dangerous because there are more people and more energy being impacted in the collision, and losing control of a vehicle can be fatal. If you lose control of your car, keep your hands on the wheel and shift into neutral as you attempt to skid away from other vehicles. An early morning accident involving a horse trailer resulted in two injuries and the death of the trailered horse when the trailer jackknifed, turning over into oncoming traffic. Trailers are susceptible to weight shifts from the contents being towed, which means that sudden maneuvers can be very dangerous for both driver and passenger. Always use extra care when driving a trailer by decreasing your speed and increasing your following room.